Our last pit stop had been Carmarthen. We were on the A486, then at Synod Inn, we turned right and swung into the A487, a road we were going to use a lot during our short Wales trip. By then we were on the road for almost an hour without a break, when we came across a pretty town with festive buntings, gaily fluttering in the wind. The elegant Georgian architecture and the rows of brightly coloured houses looked too pretty to ignore. I confess I have a bit of soft spot for buntings and pretty colours. Plus the high street boasted some nice shops and kinda looked busy & cheerful. So I wanted to halt, stretch my legs and have a look around. 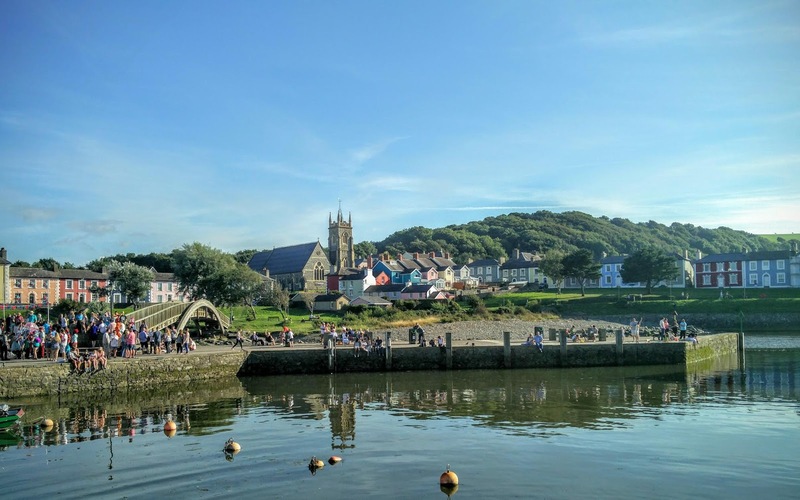 But we were almost at the fag end of our journey from Sutton, a London suburb to our hotel perched on the Cardigan Bay. Husband had been driving for about 5 hours with a few breaks, here and there. Sat Nav showed just 14 minutes to our destination, so he wanted to drive on. 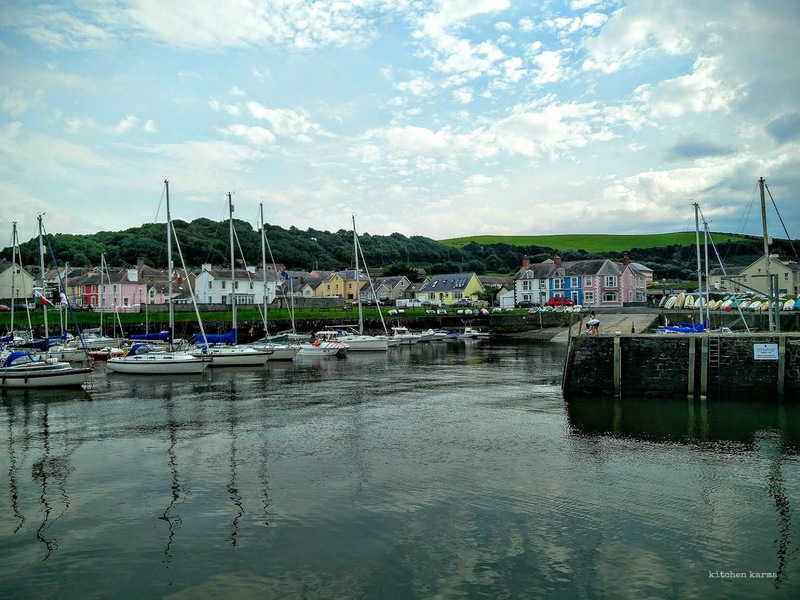 We drove to the hotel to check-in, a chat with the proprietor confirmed that the quaint little place is called Aberaeron and it's the nearest town. We decided to go back to the town to explore and have dinner. While driving back to Aberaeron from our hotel which was near the village of Llanon, we were completely mesmerised by the stunning views. 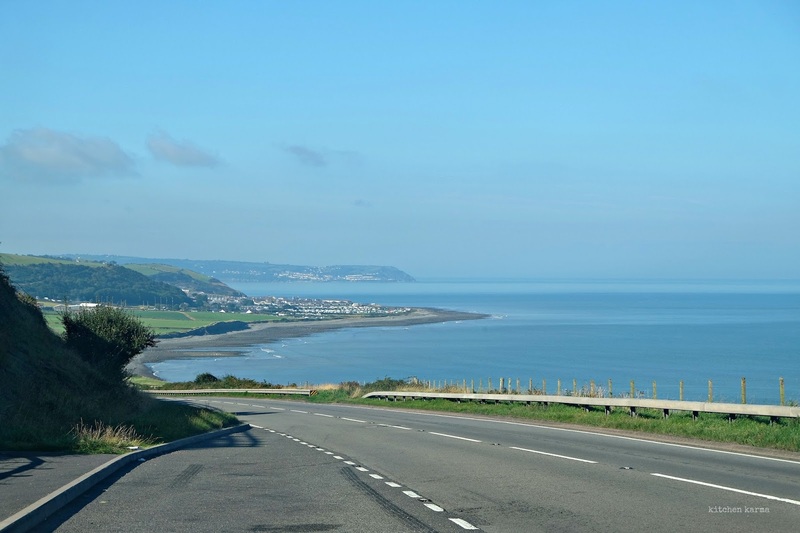 A487 between Llanon and Aberaeron runs close to the coastline. A quick check on the Roader's Digest confirmed this and they mention that this stretch of the road is generally under a mile from the sea for some distance. While some of the road has a high seawall/fence blocking the view, some of it is open with a low fence and the view is spectacular. A487 starts to dip, showing off the dazzling Cardigan Bay and the small town nestling on the coast and beyond. I think this stretch is one of my all time roads. Also the road is pretty broad and the drive is relaxing. 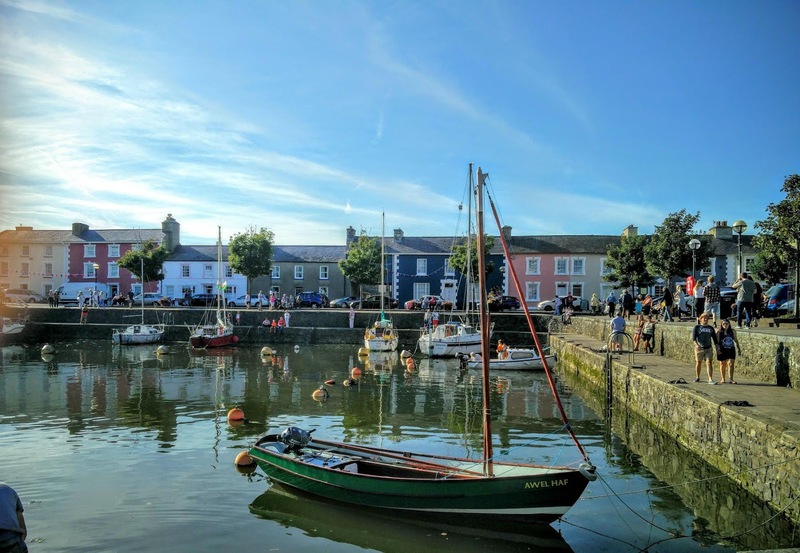 The first evening we were lucky enough to get parking right in the quay bang in the centre of Aberaeron, which much to our surprise was free. 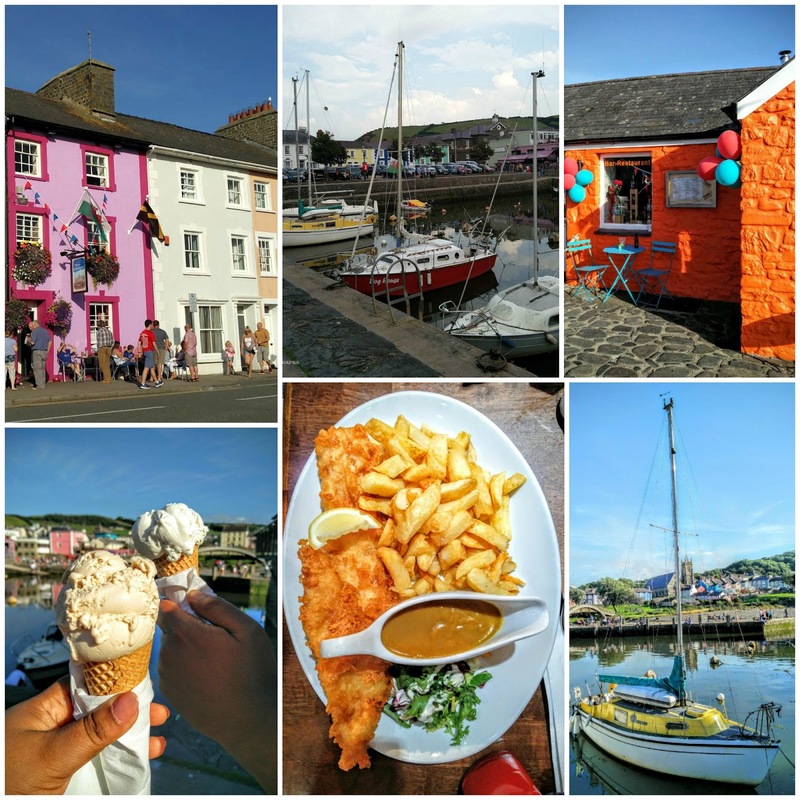 A little walk to explore the town made us realise that the town is located on the coastline of Cardigan Bay and has a harbour to boot. The beach is mostly shingles & pebble and there are a series of groynes that run the length of the beach. 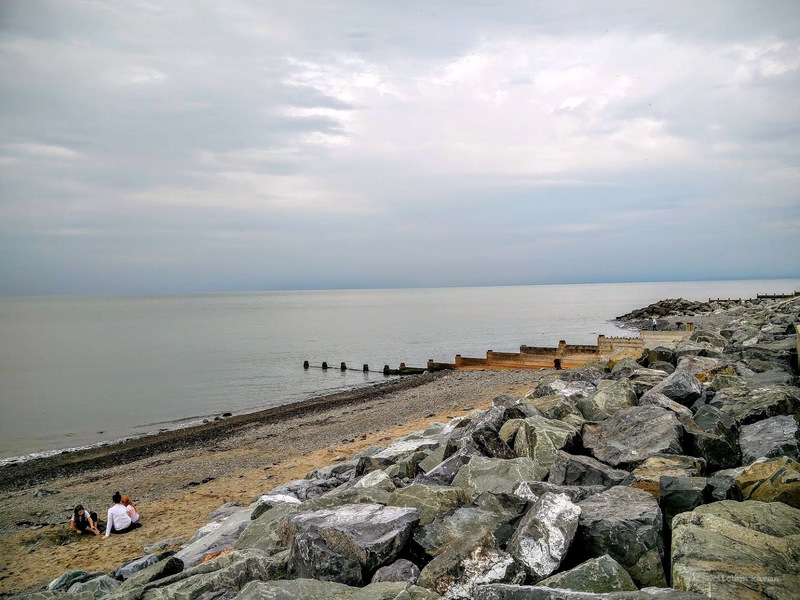 In case you are wondering what on earth are groynes, like I did when I first came across this word, according to the all knowing Google it is "a low wall or sturdy timber barrier built out into the sea from a beach to check erosion and drifting." In the photo above you can see one descending right into the sea. 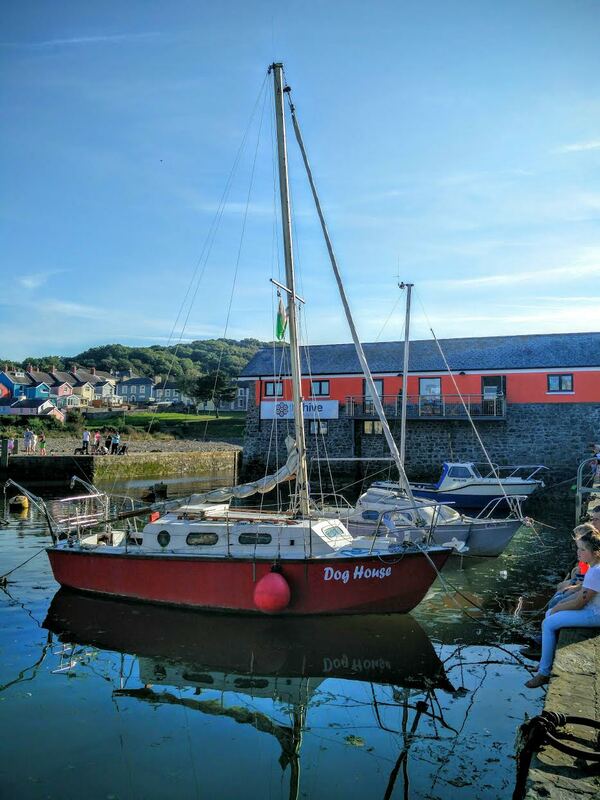 The harbour is really colourful and seem to be the hub of the community and the favoured hanging out spot for the tourists. It was bustling on the summer evening and the cafes and restaurants dotted around it were all full to capacity. There were lots of colourful boats moored and people were eating their dinner of fish and chips sitting on the benches around the harbour or were fishing or just relaxing. 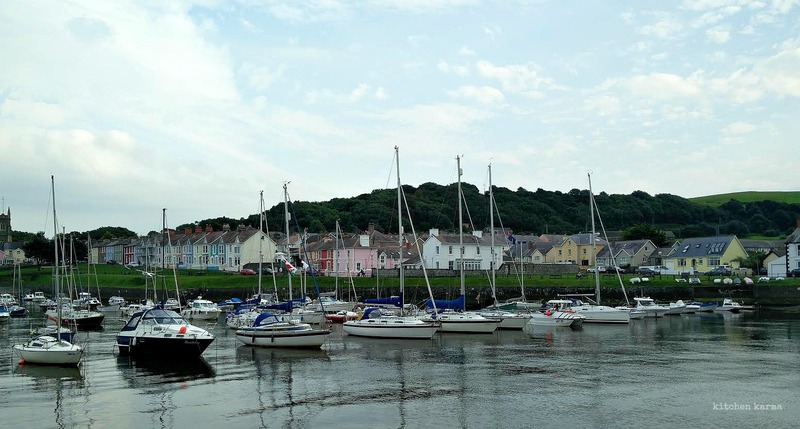 My research on Aberaeron yielded that it is a seaside resort town in Ceredigion, Wales built in the early 1800s. It was a bustling trading port and many of the naval community settled in the town's beautiful Georgian houses. The busy harbour of "Jewel of Cardigan Bay" took a hit and fell into decline with the advent of the railways from 1911. Right now the main industry is tourism and town offers a lot of interesting events throughout the year to attract tourists from all over the world. Also there are loads of places to stay in that area including a caravan park. On our first evening we decided to have fish and chips from a popular joint. I was a little disappointed, the food was rather too greasy. But was impressed with the local honey ice cream which we enjoyed sitting on the harbour. We were so charmed by the little town that we decided to go back another evening. Unknowingly we chose a day when the town was celebrating it's annual carnival. It was busy and the little town was packed. 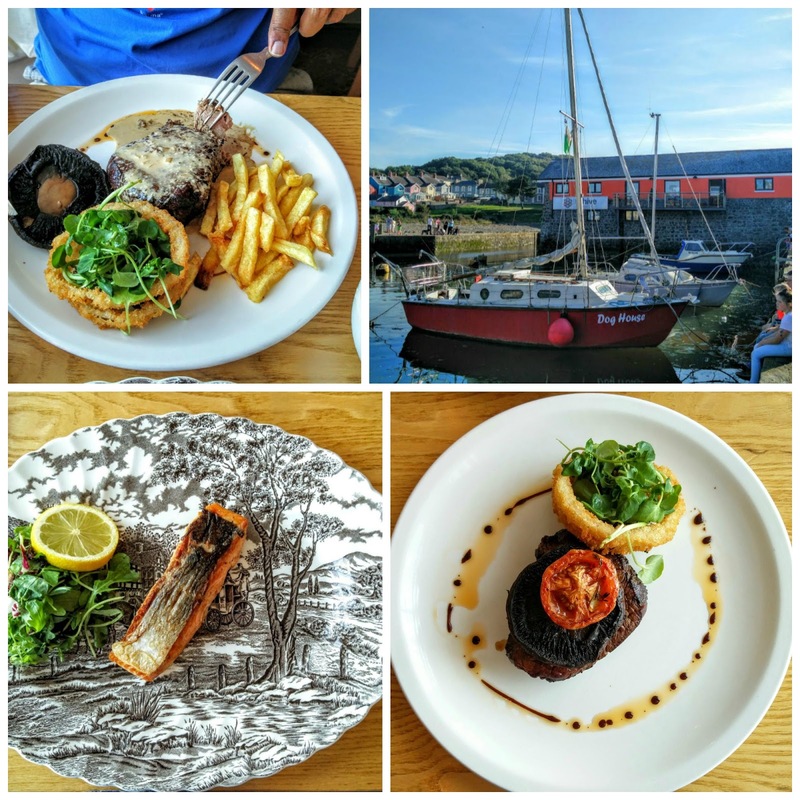 We were rather tired after spending the day in Pembroke Castle, so decided to have an early dinner in a relatively peaceful place and head back to our hotel. We chose the Manuka, when I first popped in to enquire, they were not yet open. The lady setting up the tables asked us to come back in half an hour. We did go back, we were the first diners and it was really peaceful and quiet after the carnival madness outside. We had a lovely meal sitting by the window watching the merry makers outside. My husband was happy with his steak which he had with peppercorn sauce. I had salmon with a side of roasted Mediterranean veggies. The place soon started filling up and we meet a lovely couple, co-diners, who live locally. They were wearing the carnival colours (we saw a sign post on one of the shop windows announcing that 2016 carnival colours were turquoise and red). We got chatting and the lady told us Manuka was by far the best place to eat in the town and that the chef was trained under Gordon Ramsay. We really enjoyed our visits to this quaint little town. Hope to be back some day soon! If you enjoyed this post, there's another one you may like to read. It's about the beautiful glacial lake Tal-y-Llyn in the Snowdonia National Park.